I'm so behind... my life has been pretty hectic! I started back to work at my full time job after a year of maternity leave, and I'm just starting to get caught back up on everything. The one constant - if I don't get to be creative, I go a little stir crazy! So now I'm going to try and catch you all up on the finished projects from the last few months, and hopefully I'll be able to keep a handle on what's going on a little better now that I spend part of my day on an actual computer! Back in March, I finished a lovely little pair of purple socks for a friend! These ended up in my Snobby-Spinners-Swap package for Caryn! This group is full of wonderful, supportive, fun spinners/weavers/knitters who love working with indy dyers and fancy wools and yarns. They make fantastic stuff, and I'm so lucky to be a part of their group. Caryn and I drew each others' names and I decided to knit her socks, since that's what I'm good at. 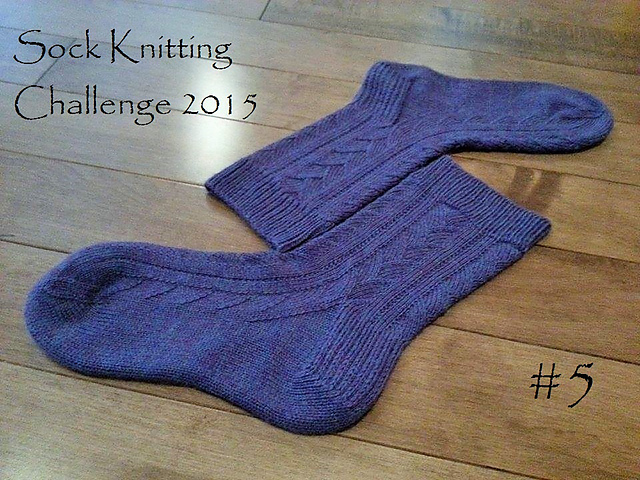 Sock Knitting Challenge - Pair Number 6Plain Jane. Looking for something plain and simple for a change :)Sock Knitting Challenge - Pair 3!Cables and Lace combine to make up this lovely pattern... Love`s Wings - the latest completed pair f...Sock Knitting Challenge - Pair #7Pretty Purple "Pinstripe" Knock-offs... a slipped stitch to jazz up plain socks. Love this pair! Po trafienie inny w cugu trzech lat prawie prze?y? umówiony termin spo?ród T Najwy?szego. Aled?wi?k Trybuna?u by?o alias tym razem. Pierwsza rozstrzygni?cie, w 2012 roku, by?o z?amanie co wi?cej nieotwart?, podczas czwartkowego orzeczon? by? wybitniej arbitralny.